Pacific Palisades is primarily a residential area, with a mixture of apartments, condominiums, small usually older houses and large private homes. There were lots of television shows and movies filmed in Pacific Palisades, like Baywatch (filmed on Will Rogers Beach), Rockford Files, Freaky Friday with Jamie Lee Curtis and Lindsay Lohan (filmed at Palisades Charter High School), Curb Your Enthusiasm (filmed in the real-life residence of Larry David), and Food Network's, Everyday Italian is filmed on El Medio Ave. 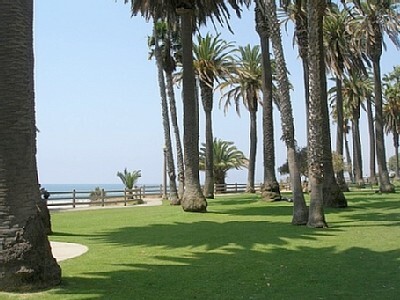 The park itself is a great place for a picnic, a stroll or just hang out and take in the beautiful views of the Pacific Ocean. It's pretty clean and manicured and my favorite part about this park, besides the views is the palm trees. The Getty Center, also known as the J. Paul Getty Museum is a top notch museum specializing in pre-20th century European paintings, sculptures, illuminated manuscripts, drawings, while also boasting a large collection of 19th and 20th century American and European photographs.